It has been a few weeks since the Networked Publics conference that we convened at the Annenberg Center. It has taken me a while to dig out from the backlog after the conference and to gather some of my thoughts about it. Just for starters, I love this photo posted by Jonathan McIntosh that you can see in the Flickr NetworkedPublics tag stream. It exemplifies what was so great about the gathering for me, getting folks across boundaries of academia, activism, and creative practice together like in this photo: Jonathan McIntosh of ad remix fame, uber autonomist Marxist political theorist Harry Cleaver, and our own netpublics fellow Merlyna Lim and very talented graduate students and activists Sasha Costanza-Chock, Aram Sinreich, and Richard Hodkinson. As John Tomasic has blogged with more insightful humor than I can muster, the event was characterized by a series of confusing disconnects. But doesn't everyone look like they are having a good time? Ray, Bob and I spent last week out in Los Angeles at our institutional digs (the Annenberg Center for Communication at USC), where we held a pair of meetings with professors from around the US and Canada to discuss various coups we are attempting to stage within the ossified realm of scholarly and textbook publishing. Following these, we were able to stick around for a fun conference/media festival organized by Annenberg's Networked Publics project. As we enjoyed this little feast of new media, I was vaguely aware that the Tribeca film festival was going on back in New York. As I casually web-surfed through one of the panels — in the state of continuous partial attention that is now the standard state of being all these networky conferences — I came across an article about one of the more talked about films appearing there this year: "The War Tapes." Like Gunner Palace and Occupation Dreamland, "The War Tapes" is a documentary about American soldiers in Iraq, but with one crucial difference: all the footage was shot by actual soldiers. There were panels on the Digital Homemade -- low tech alternatives to the commercial media we're used to. Alternative News -- amateur blog journalism, link aggregation, etc. and Network Hacks/Hack Networks which had all the funky amateur tech, backpacks that double as wireless hotspots, networked catflaps, cellphone jammers, etc. It's good seeing the range the conference was covering, though a little intimidating as now I felt like the guy who goes up after all these intellectuals and says "er, I play with cartoons.." but hey ;)...Still it got positive feedback so I guess we didn't do hideously bad ;) The technical aspects were certainly appreciated more than the visual aesthetics which I was pleased at, I kinda expected that but still. Reading Nert next to Harry Cleaver's response tells one story of what for me was a productive disconnect. Generational and cultural divides in what makes up participation and engagement loom large. But it sure was fun to have these different perspectives in the same room for a few days. It warms my anthropological heart to have designed an event where most people seem to have felt a little marginal. But more on my postmorten shortly. Well, with respect to machinma and anime remix, it's my impression that the availability of tools is giving more people access to such means of expression. However, two things: first, the tools are still complex and, from all we heard, terribly time consuming so that "access" means little at this point because very few people have either the skills or the time and energy to devote to such efforts; second, as a result, it seems that the result is only a very marginal contribution to "participatory culture" and that contribution takes more the form of creating and circulating artistic works than contributions to any kind of community interactivity. Some remarks on Friday and Saturday's "Networked Publics" conference. While I’ve always been a dedicated advocate of constructionism and of cyberspace, I left the NetPublics symposium fearing that if Karl Rove had attended, he’d conclude that America’s best and brightest were obsessed with living in fantasy worlds of elves and orcs, and ornamenting the urban landscape with colored LEDs. And I fear he’d be quite happy. attended the netpublics conference at the annenberg center the past friday and saturday, largely out of curiosity about one of the DIY panels on friday, and because I wanted to see the locative / place / space panel on saturday. The DIY panels on Friday (that I attended) were mostly about the standard self-publishing type stuff that I’m pretty familar with, although it’s always good having smart people like Sean Bonner and Joi Ito discussing it, even if their points seem sort of run of the mill for alpha web geeks. Machinima is a hybrid medium, a mix and remix of filmmaking and game culture. Its life started in 1996 as an afterthought—a nearly overlooked existence within the gaming community, then known as "Quake Movies." In the last ten years however, Machinima has matured quietly; finding a home not in its parent industries of game, animation or film, but in the users who have nurtured and recognized its significance. In its continuing evolution, Machinima has come to exemplify our convergence culture - an evolving space that embraces legacy creative technique while mounted on advancing technologies - and shaping how entertainment is made and enjoyed. Below are a diverse set of works developed by artists whose backgrounds are equally as scattered. They represent not only a somewhat loose retrospective of Machinima's history, but also the blurry lines between fandom, subversive fetish and grotesque commercialism. Synopsis: The Rangers attempt to corner a lone gunman that has targeted the group for assassination. 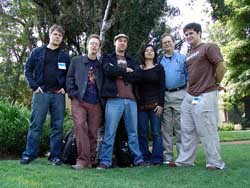 Definitively the very first Machinima created (back in the day they were called Quake Movies), Diary of a Camper laid the groundwork for Machinima works to come. 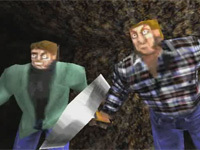 Synopsis: Distributed originally as a native Quake demo file, Apartment Huntin’ follows the goofball antics of Larry and Lenny Lumberjack as they try to obtain their first apartment together. Synopsis: Randall Glass mixes pop culture audio with Halo, as he attempts to launch the game’s famous vehicle, the Warthog, over a natural arch in the game’s terrain. Finely edited with humorous effect, this Machinima was nominated for Best Editing in the 2002 Machinima Awards. Synopsis: Exploiting Battlefield 1942’s physics is the name of the game, as one of Europe's prominent gaming clans mixes music with mayhem in this Machinima music video. Synopsis: Two teams of viciously trained soldiers are left to ponder life, the universe and everything during a stalemate over a box canyon. 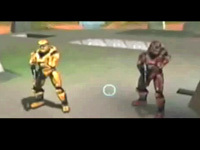 One of Machinima’s premiere success stories, Red vs. Blue has currently completed its 4th season and receives up to 1 million downloads per episode. Synopsis: "Return" is the tale of Voldigar of Stromgarde, a grizzled warrior finally returning to his beloved home and bride only to find his past in ruins. Utilizing the World of Warcraft game engine and lore, film-makers Terran "Liadov" Gregory and Ezra "Voldigar" Ferguson take Machinima down the road of the classic cinematic fantasy epic. Synopsis: “...Layer Zero 7's mesmerizing sound into the equation and you're looking deep into an enigmatically experimental visual experience that tells the story of a lonely robot's search for meaning and emancipation from the routine of daily existence in outer space." Synopsis: “I'm pushing to get to her fast enough, pushing through the crowd. Though whenever i come it's too late. It's like my blood would freeze. But somehow, she's only there for me. The only thing that remains on the film is her message..." The Photographer is created in UnrealTournament2004 from Epic Games and runs in realtime within the game. 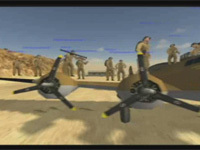 It canbe presented both as video or as a high resolution realtime performance. 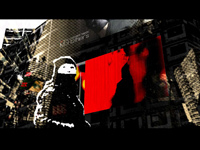 Synopsis: Filmed within the lush and unique universe of ”˜The Matrix Online’, this short work of independent machinima attempts to reenact the killing of Jean-Charles de Menezes within its coded confines. The de Menezes case is carefully studied from all perspectives and the story is presented both as officials initially misreported it and as the world now knows it to have unraveled. The accompanying audio is a montage of raw live “eye witness” accounts, ongoing news reportings and heartfelt protests in the killing’s aftermath. The parallels that exist within the Matrix trilogy itself and the case of Jean-Charles de Menezes are unmistakable. The illusion of freedom when one is a member of a “free” society, the oppressive nature of control constructs and the plasticity of “perceived” reality are all evident in the Jean-Charles de Menezes case and in this virtual reenactment they continue to underline the relevance of the Matrix saga as a whole. Synopsis: This movie is about how one couple copes with a tradegy and how you can feel alone in a marriage. It features a song by Kate Bush called "This Woman's Work." Synopsis: From The Movies' site: " Chronicling a single day in the life of a troubled schoolgirl, GIRLS NAMED JANE is concurrently a universal story: “ it is the story of every woman without a voice. Sexually and psychologically abused by her father, Jane struggles with questions of identity and the dilemma that forces her in a blind quest to find someone Ã¢‚¬“ anyone Ã¢‚¬“ who will help her. Are there other girls named Jane willing to listen to her? WARNING: Film contains mature themes and situations. View at your own risk." Synopsis: From the author's description - " This is almost a story about Puppet reciting Edgar Alan Poe poem named, well, "A Dream Within A Dream". This is all what mechanical Puppet can do, but, be aware - after Puppet finish his recital and movie ends, mechanism will start again." Synopsis: To introduce Snoken's latest Machinima epic, Mine 2, Noken produced a parody of the highly popular superball-infused spot for Sony's Bravia. In the trailer, dozens of BF2 players imitate superballs by performing bunnyhops through a Battlefield 2 level. Cut together with the same track as the Bravia ad, this Machinima piece gained widespread attention through blogs Kotaku and BoingBoing. Synopsis: Another Snoken production - this time by director Andreas Pettersson, merging the video game worlds of Battlefield 2 with old school Nintendo games such as Duck Hunt and Super Mario. Synopsis: "You can't handle the truth!" yells Jack Nicholson's Colonel Jessep in the classic film "A Few Good Men." 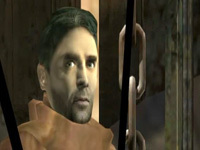 Updated using characters right from Valve's own classic, Half-Life 2, Machinima filmmaker Randall Glass ("Warthog Jump") lifts the audio from the famous courtroom scene, and places Half-Life's Barney in the Tom Cruise role, while the G-Man channels Nicholson's likeness and mannerisms (thanks to Valve's FacePoser tool and custom animations by Glass). 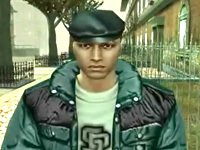 A great fusion of game and film culture, A Few Good G-Men has become another net-based phenom as this Machinima piece has been extremely popular across a variety of different sites, including 11,000+ views on IFILM.com alone. Three scenarios for U.S. broadband access evolution originally produced for the Networked Publics conference by Walter Baer, François Bar, Shahram Ghandeharizadeh, Fernando Ordonez, Aram Sinnreich and Todd Richmond. It’s 2017. The U.S. government runs the national communication GRID (Government-Run Information Distributor), comprised of the country’s fiber optics, cables, and radio links. Access to the GRID is open to all, on an equal basis, for any application and any content. Most of the population now creates and shares media of all kinds—what their productions lack in polish and sophistication, they make up in imagination. Thanks to the government-run GRID, there no longer is a divide between urban and rural areas. The open access GRID has ushered in the era of micro-politics: every conceivable constituency can propose any initiative at any time, and set up a virtual debate space, and e-voting mechanisms. Neutral Net was set in motion in 1983, when the FCC forced the local phone companies to let all eEnhanced sService pProviders use their wires for free. Within a few years, thousands of Internet Service ProvidersISPs jumped at the chance to offer new services without the need to invest in costly networks. With the release of the Mosaic Internet browser in 1993, a new mass medium was born. Soon after, in 1995, DSL and cable modems turned the old phone and cable television networks into broadband always-on information networks. During the next ten years, a multitude of innovators built upon the open Internet to offer new communication services that radically transformed people’s ability to create, share and access information. In our scenario, in September 2010 the U.S. Congress decided it essential to preserve the Internet’s openness. Strict rules forbid all network owners, telephone, cellular, and cable alike, to discriminate among users. They are not allowed to favor any traffic, nor to charge different fees for different users or different applications. Anybody can now provide any communication service over the carriers’ networks. Wal-Mart introduces low-cost “WAL-Media”: their branded combination of wired and wireless Internet access, voice and text communication, and film and video distribution. In the next few years, amateur production of content explodes. YouTube and MySpace garner audiences that far surpass those of traditional television channels. Blogs have now replaced newspapers as most people’s primary source of news. The Net supports a vibrant public sphere in which all constituencies find a voice, a virtual town hall, and viral tools to mobilize voters and make their voices heard. To sort through this massive amount of news, debates, games, music, video, and films, users rely on each other. Social filters, recommendation engines, and distributed online marketplaces allow them to find, discover, rank, and select materials that match their passions. Every device on the network is a server, whether in homes, public places, small businesses, or civic organizations. They support peer-to-peerP2P communication tools;, distribute user-produced stories, songs, and videos; and, host collaborative spaces that bring together families, workgroups, clubs, churches, or citizens. A growing number of cities build their own Wi-Fi and fiber networks to foster greater civic Internet use. However, funding for professionally-produced premium content starts to decline, partly because it is impossible to guarantee the network performance that would allow optimum delivery of that content and, partly because P2P distribution of pirated content proliferates (it is hard to maintain control over IP intellectual property now that a multitude of service providers operate over the networks). By 2012, network owners are unable to raise funds to upgrade their networks. Verizon discontinues FiOS, and AT&T abandons project Lightspeed. Cellular networks never fully upgrade to 3G. The network owners decide to become pure bit -carriers, scale down their production and programming operations, and concentrate instead in on cutting their costs down to a minimum, retaining only skeleton maintenance crews. Meanwhile, although content from millions of amateur sources is now available, Hollywood loses its pre-eminence as the world’s main center of content production. Instead, big-budget entertainment is now produced in countries like China, France, and India, where the network owners keep tight control over who distributes what, and can thus guarantee protection of their IPintellectual property. By 2014, investment in the U.S. network infrastructure has now fallen so low that its derelict state resembles that of the nation’s bridges and roads. To ward off catastrophic failure, the U.S. government takes over all communication networks, consolidating them into the Government-Run Information Distributor (GRID). A new tax on advertising is created to fund the GRID. By 2017, the GRID provides uniform Net access throughout the U.S. territory. The nation ranks a weak 29th twenty-ninth in the OECD’s assessment of broadband performance, but a dynamic community of users constantly invents new ways to squeeze extra bits out of the country’s infrastructure. U.S. elites are dissatisfied with the poor performance of the national GRID. They live in tele-parks, the new gated communities, which tend to congregate in border -cities and ports, where they get easy access to foreign network head-ends and submarine high-capacity fiber. The path to TCNOtopia began in 1969, when the first bits sped across a new computer network funded by the U.S. Department of Defense. Soon the elements of what would become the Internet were in place: an open architecture where users innovate at the edges of the network and E2E communications with no gatekeeper inside the network core, all of it riding on top of the nation’s phone network, providing little compensation to the telcos who had built that infrastructure. In fact, the Internet stands in sharp contrast to telephone and cable visions, which place intelligence, control, and innovation inside the network. By 2007, the TCNOs provide more than 96% of residential broadband connections. But most of the real profits are made by firms who use the TCNO networks, such as Microsoft, Amazon.com, Google, Yahoo!, eBay, and Disney. Verizon and AT&T fight back with Internet television, offering hundreds of channels and thousands of hours of on-demand programs. Like the cable companies, they want to choose the content they deliver over their broadband pipes and not simply act as common carriers. AT&T’s CEO declares that Internet content providers will have to pay extra for fast broadband delivery. In reaction, content providers join with consumer groups to persuade Congress to preserve network neutrality. But they get a chilly reception in Washington. Instead, Congress gives telcos authority to freely offer Internet programming and decide what traffic gets priority within their network. 2010: Based on the early success of Wi-Fi in Philadelphia and San Francisco, Google launches broadband wireless nationwide in partnership with local municipalities. Verizon and AT&T, followed by the cable operators, offer contracts to Sony, Fox, Disney, and others for fast-lane Internet delivery of their online games, movies, video, and other content. Those who choose not to pay must accept standard delivery. This slow lane is where user experimentation is allowed, the only option for user-run servers, and P2P and other applications unaffiliated with the carriers. To enforce the separation, the TCNOs now scan all data packets. Customer contracts authorize carriers to screen for viruses, spam, copyright violations, and content of interest to government agencies. These contracts also limit the bits users can upload without paying substantially higher fees. 2011: Most large content providers are enthusiastic about fast-lane delivery. They can now charge higher fees for premium media experiences. But some, like Google and Microsoft, mount court challenges to packet scanning and prioritization as violations of users’ privacy rights and of network operators’ obligations to provide common carrier services. 2012: Flush with cash from content providers, TCNOs accelerate investment in fiber infrastructure and in-network innovations to achieve high performance. Dozens of new services, such as online multiplayer sports and games, become wildly popular. With full control over individual data streams, the carriers can craft compelling multimedia experiences for their customers. TCNO interface equipment in the home also optimizes the user experience, while preventing unauthorized copying of content or the bypassing of advertising messages. Meanwhile, Google’s broadband wireless buildout has achieved initial success with four million subscribers in twenty-eight cities. However, security and reliability concerns arise after hacker attacks disable some fifteen thousand wireless-enabled computers in Chicago and Los Angeles. The TCNOs effectively use this security failure in their broadband marketing campaigns. 2014: The U.S. Supreme Court rules in favor of the TCNOs’ right to scan data packets and prioritize Internet traffic. The decision cites the need to ensure network reliability and protect customers from hacker-induced harm. 2016: The merger of Comcast and Time Warner creates a behemoth controlling 90 percent of the U.S. cable market and 60 percent of all broadband connections. After reporting billion dollar losses, Googlezon (formed by the recent merger of Google and Amazon.com) abandons its municipal wireless partnerships. Some cities vow to keep their networks on the air, but it appears an uphill struggle against the dominance of TCNO broadband. 2017: Determining that only increased scale can compete effectively with Comcast Time Warner, the Justice Department approves the merger of AT&T and Verizon. The broadband duopoly has no serious rivals. It has brought affordable broadband to 85 percent of U.S. households, who love the network innovations that protect against spam and viruses, the e-sports leagues, and the high-definition entertainment they receive from TCNO content affiliates. Political expression online is encouraged within the established political structure—primarily through the two dominant national parties that have negotiated fast-lane delivery for their candidates and issue messages. Other political organizations and civic groups must negotiate ad hoc arrangements, and few have the financial resources to assure fast lane delivery of their messages. But perhaps another eBay, Napster, Yahoo!, Amazon.com or Google is ready to emerge out of the competitive chaos in India or Brazil. In the year 2015, the Internet addresses the last-mile challenge using a mesh network of wireless devices named AutoMatas. The traditional telcos are now relegated to routing the backbone traffic. AutoMatas are self-organizing devices that communicate with one another when in each other’s radio range. They may use access points available at hot spots for access to the telcos’ wired infrastructure. AutoMatas are now ubiquitous in society and a standard feature in all new vehicles. Their widespread use contributes to augmenting the capacity of the wireless mesh network that effectively transmits the last-mile traffic. An early example of wireless ad-hoc networks is the use of short-range radios by truck drivers to communicate road conditions and socialize while traveling. The need to exchange information and communicate while in motion was later satisfied through the use of mobile phones, although this system does not operate on an ad-hoc mesh network. The origins of the wireless ad-hoc network organized around AutoMatas dates back to 1991, when Vic Hayes of NCR Corporation in the Netherlands invents Wi-Fi for use with cashier systems. Prior to his retirement in 2003, he shapes the design of standards such as IEEE 802.11a, b, and g, becoming the “father of Wi-Fi.” The devices that operate on this standard have a limited radio range in the order of tens of feet and offer bandwidths in the order of tens of megabits per seconds. In the first years of the new millennium, a number of different events begin to lay the ground for the emergence of a wireless mesh network. Lightweight portable products with gigabytes of memory storage, such as the iPod, hit the market enabling the consumption of digital entertainment on the go. COVERGE 2001 is a first conference dedicated to convergence of automobiles and computers. Participants discuss standards for an in-vehicle multimedia network. Mesh networks emerge in neighborhoods using Wi-Fi devices based on IEEE 802.11a, b, and g and offering Internet services to their residents. 2009: Advent of Wi-Fi tailor-made for mobile vehicles. The technological leap to enable Wi-Fi on mobile vehicles occurs in 2009, when companies introduce products based on 802.11p, also referred to as Wireless Access for the Vehicular Environment (WAVE), offering radio ranges in the order of a thousand feet with bandwidths in the order of megabits per second. Such ranges make possible meaningful exchange of information between vehicles that are in motion and base stations. 2010: The U.S. Congress makes a significant part of the analog broadcast spectrum available for unlicensed use. Groundbreaking work in interference-avoidance techniques has enabled efficient use of this spectrum. This big-broadband wireless spectrum represents the future of wireless communications. The unlikely group of successful bidders for the spectrum is composed of EarthLink, Sony, Cingular, GM, and Toyota. While EarthLink and Sony are preparing for general distribution of wireless content, the car companies are observing this from the consumer’s end: soon vehicles will be capable of receiving massive quantities of wireless content reliably, and new vehicle designs in the works are incorporating these features. 2011: The year 2011 witnesses the development of AutoMata. These wireless devices, looking like iPods and weighing less than 10 ounces, store audio and video clips, implement navigation and GPS capabilities of an automobile, and detect one another for multi-player games that extend a physical world with virtual objects. AutoMatas include terabytes of storage, and several types of wireless cards such as cellular, 802.11g, 802.11p, and Bluetooth. These networking cards operate in a variety of radio ranges (from a few feet to miles) and bandwidths (tens of kilobits to hundreds of megabits per second). Numerous car manufacturers begin to combine the vehicle’s telematics, navigation, and entertainment systems into AutoMatas for new models. These devices plug into an in-vehicle network to guide a driver to a destination and deliver entertainment content. Its owner may carry the device and use it as a personal digital assistant and personal audio and video entertainment unit. 2012: Hackers publish the programming interface to AutoMata, adding features such as text-to-audio and a VoIP interface. Using a Bluetooth-enabled headset, a user may listen to e-mail messages. Consumer electronic vendors are quick to adopt these novel features, publishing official versions for download by all. This grassroots effort introduces many safety features for in-vehicle use. For example, when in radio range of one another, AutoMatas exchange traffic information and hazards such as icy road conditions. An elegant holder on the front dashboard of a car provides for both re-charging of the AutoMata and its view of the road in front of the automobile. A passenger may view what another vehicle’s AutoMata might be recording several minutes ahead. Insurance companies start to give incentives to drivers who use voice activated AutoMatas that warn them of road hazards. 2011: Competing AutoMata-like devices reach the market, driving down prices and improving their efficiency and capabilities. In addition an active community of programmers continue to develop applications and operating systems and standards for AutoMatas. Devices are everywhere, creating an ad-hoc mesh network that begins to produce and route growing amounts of Internet traffic. In particular, the planned pre-staging of popular content to make it accessible to the mesh network is effectively reducing the last-mile Internet traffic. Users begin to switch from home ISP subscriptions to maintaining their AutoMata connectivity, much like mobile phone usage affected standard telephone lines. Telcos point to the growing traffic created by the mesh network, and its lack of security, to insist on the need to manage traffic on the Internet backbone to justify the investment in increased capacity. There is a surge in spam and identity theft due to the increasing Internet traffic on the mesh network. Soon telcos develop enhanced certification methods for personal messages and improved cryptography techniques for security introduced by academics and other users of the network. 2014: GM and Ford introduce software for AutoMata, enabling cars from 2014 onward to drive without human assistance on certain freeway stretches. A valid driver’s license holder must sit in the driver’s seat and agree to the risks of using AutoMata. When an intelligent road stretch is encountered, AutoMata signals its driver that it may assume responsibility for driving the car. These devices communicate with one another to share information about icy road conditions, accidents such as chemical spills, and other emergency situations. Devices minimize accidents by slowing down and stopping when too close to one another. There is a steady reduction in the use of mobile phones once the mesh network provides better coverage in most urban settings than the nonintegrated cellular networks due to the ubiquitous presence of the AutoMata. Mobile phone calls are now mostly conducted with the AutoMata using VoIP. 2015: An AutoMata is now the size of a company pin that one wears on a business suit. It records and stores hundreds of hours of phone and live conversation, along with hours of video recordings. Its battery works for days of usage. For their display, AutoMatas utilize TVs in a living room, a laptop’s display at work, a mobile phone’s display on the road, and a car’s navigation display or fold-down screen. New and inexpensive displays start to appear in automobiles and coffee houses. Menus at high-end restaurants turn into a display and a keyboard for AutoMatas. A year after the introduction of automatic driving by AutoMatas, observing a significant reduction in the number of accidents, many insurance companies give incentives to those who employ AutoMata to drive. In collaboration with tens of insurance companies, the U.S. Department of Transportation deploys Internet wireless hubs on most highway stretches in the country. Its primary purpose is to increase road safety and enhance emergency response. This new infrastructure helps create an alternate Internet backbone to the mired telco network and its traffic-management practices. There is now an alternative backbone for delivery of delayed modes of communication, alleviating the load on the telco’s wired backbone infrastructure. 2017: In cities such as Los Angeles a growing number of people are driven by their AutoMata from place to place. A vehicle then has become an extension of both the office and home. Special content is released for in-vehicle entertainment systems, capitalizing on the enclosed nature of the vehicle to immerse passengers in an experience. Bollywood of India finally supersedes Hollywood in revenues by generating content tailor-made for in-vehicle use. Widespread amateur production and improved social filters have enabled a broad dissemination of diverse content and ideas, effectively “fattening the long tail” for entertainment, commerce, and political movements. Every idea is capable of finding its audience, however, due to the large number of possibilities available, advertising on the Internet and on hardware is still able to shape public opinion. Much like important content producers such as Disney, powerful interest groups such as the NRA and Texans for a Democratic Majority promote their message through product placement on antivirus and antispam software and new equipment. In addition, content can be prioritized by pre-placing content through the access points to the mesh network for a fee. Widespread use of AutoMata has lead to a decline of home ISPs; local Internet traffic is routed through the mesh network, and traditional telcos are relegated to routing part of the backbone traffic. Bandwidth and latency on the mesh network is affected by the number of AutoMata present. curated by zalas Fansubs are subtitled videos created by fans, and are generally released and distributed over the Internet. The movement for fansubbing was driven forward by English-language fans of Japanese origin television such as anime and dramas. Fansubs exist in many languages other than English, but English language subs are the most common. It is because of volunteer fansub communities around the world that anime and J-drama has achieved a wide following around the world. Most fansub groups see themselves as evangelists for Japanese media industries overseas, and will only subtitle series that have yet to be licensed in the target language. Once a series has been slated for commercial release overseas, most fansub groups will remove their works from the net.